About: Avera Health is an integrated health system comprised of 33 hospitals with more than 330 locations throughout South Dakota and four surrounding states. The organization manages approximately 2.4 million visits per year. The Need For MEDITECH: Supported by business and clinical intelligence data, Avera Health identified sepsis as the number one opportunity for care improvement and cost reduction across their system. Soon after, the organization defined a system‐wide goal to reduce sepsis mortality by collaborating with multiple disciplines, providers, and facilities throughout the Avera system to implement a standardized sepsis toolkit in MEDITECH. A key focus of the project was ensuring that the screening and treatment protocol could be used universally across the system, ensuring the Avera brand promise of providing consistent standardized care at all Avera hospitals. Tools to monitor compliance and effectiveness. By implementing these processes and raising sepsis awareness through their ‘Seeing Sepsis’ campaign, Avera Health improved their recognition and response time to sepsis cases, enabling immediate treatment and desirable outcomes. Results: With its nurse‐driven sepsis screening assessments and physician order set bundles, Avera Health is using MEDITECH's integrated Expanse EHR to save lives by quickly identifying patients at risk for sepsis and initiating immediate, evidence‐based diagnostics and treatments. As a result, the organization has managed to significantly streamline workflows, reduce costs, and improve patient outcomes. Readmission rate reduction from 12.9% to 10.3% for sepsis patients and observed-to-expected (O/E) ratio reduction from .70 to just above .60 — exceeding top performers in the nation. 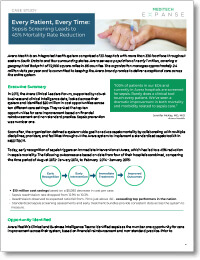 Download our full case study to learn more about Avera’s sepsis prevention program.